Rat Hole Gallery is pleased to present an exhibition of sculptural works and drawings by Berlin-based, Italian artist Monica Bonvicini on view from November 2, 2012 until January 20, 2013. Born in Venice in 1965, Monica Bonvicini explores specific conventions and social connotations, investigating the relationship between space, power, and gender. 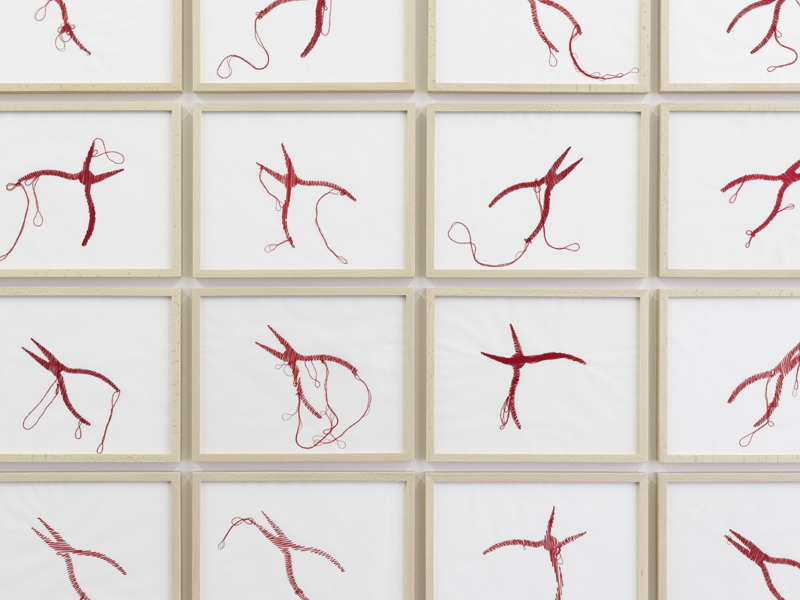 Her artistic practice varies across sculpture, installation, photography and video to works on paper. Working with traditionally “masculine” industrial materials that reference modernist architecture, such as metal and glass, and often combining them in unexpected contexts with allusions to sexual fetishism- leather, chains, and rubber- Bonvicini confronts the structures of power and seduction in architecture that surrounds us, while at the same time revealing connections between the world of labor, sexuality, politics, and social representation. For this exhibition at Rat Hole Gallery, a large-scale and site-specific sculptural installation work, Straps and Mirror, will be shown in the main gallery space. Created of large, mirrored glass panels affixed to non-functional metal scaffolds with hanging leather straps and harnesses suggestive of S/M subculture, this work not only engages in a critique of the male-dominated history of architecture, but also investigates the interrelationship between physical and social space and deconstructs the connection between function and aesthetics in modernist architecture. 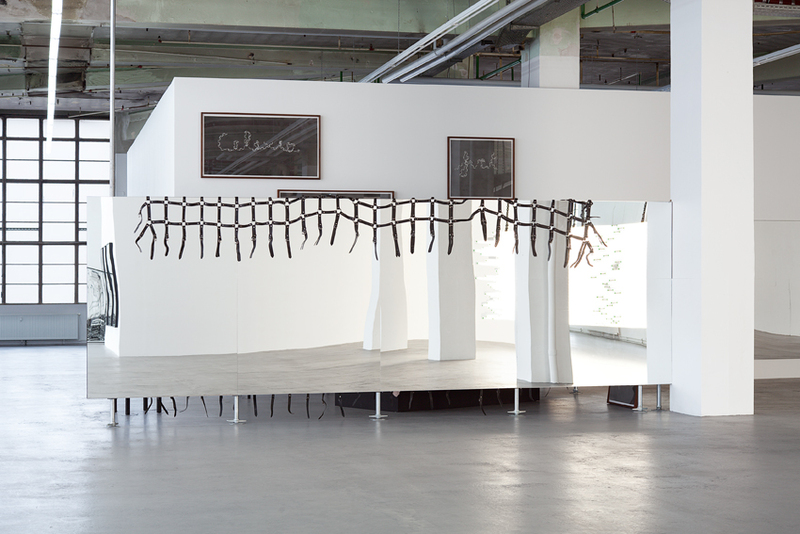 The artist’s use of industrial materials and the work’s aggressive presence in the space by way of the reflective mirrors present a formal commentary on minimalist sculpture, as well as portray that, according to Bonvicini, architectural structures and spaces are by no means neutral, but on the contrary ideologically and sexually charged. 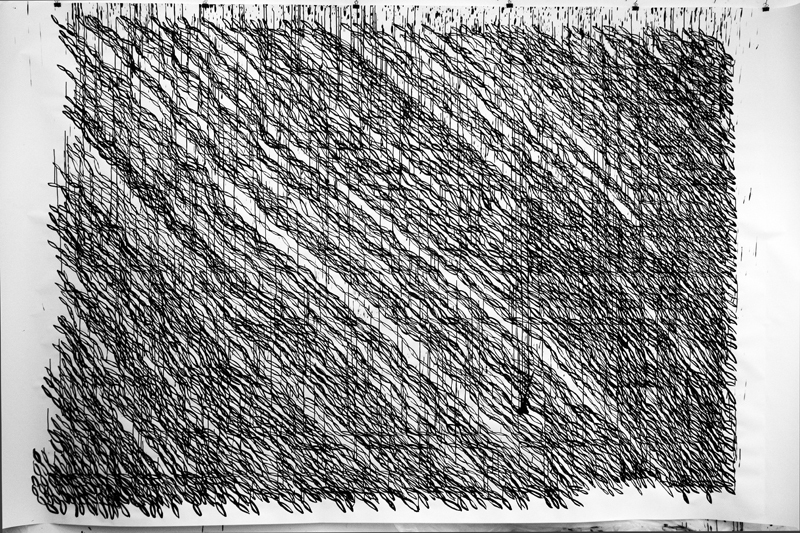 The exhibition also includes a large-scale black-and-white drawing in tempera from the artist’s Off the Grid series, which features words such as RUN and RAGE, and patterns drawn that resemble the strings and steel chains often seen in her sculptures and installations. For Bonvicini, drawings are a way of engaging directly and personally with a subject, demonstrating the notion of the artist’s process. 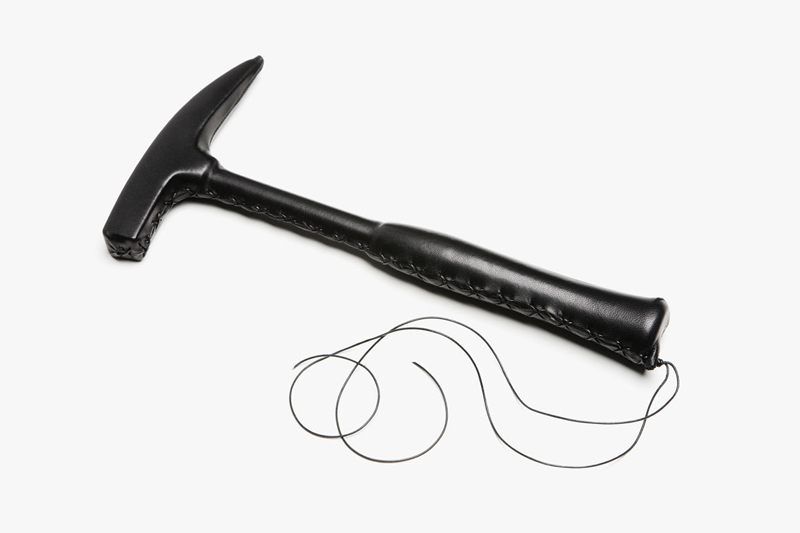 Also on view will be smaller works, including Leather Tools, sculptures of tools tightly wrapped in black leather, presented on pedestals and covered with glass, and NeedleKnows, works on paper of red-thread embroideries of needle-nose pliers which reference Freudian symbolism and the needle as a phallic object- a symbol used in much of Bonvicini’s work. Monica Bonvicini’s work has been widely exhibited in solo and group exhibitions around the world. She is a recipient of the Golden Lion of the Venice Biennial (1999) and the Preis der Nationalgalerie für Junge Kunst, Berlin (2005). Earlier this year, RUN, a large-scale outdoor sculpture commissioned for the 2012 Olympic Games was permanently installed in the Olympic Park, London. The exhibition at Rat Hole Gallery marks the first time for the artist’s work to be shown in Japan.